Clever dialogue, gothic scenery, and three old masters of horror make this film a delight to watch…over and over again. It is not very often one gets a chance to see three horror legends…Boris Karloff, Vincent Price, and Peter Lorre(plus a young Jack Nicholson)…in any movie, especially one with competent and stylized direction by a Roger Corman and a witty script by some guy named Richard Matheson( a legend in the horror and sci-fi genres and the one author that influenced Stephen King more than any other). The talent alone insures success and each of these respective masters delivers in this film. 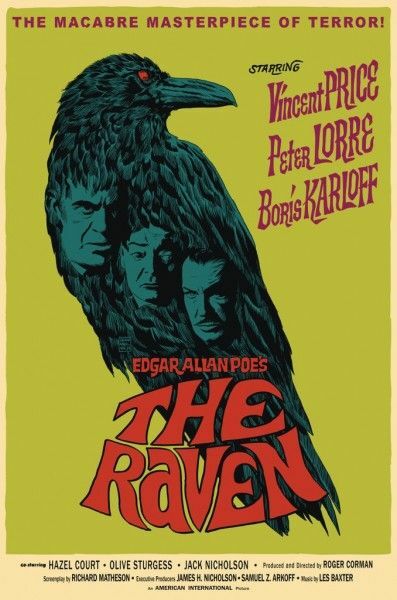 The story has virtually nothing to do with the Poe poem…but who cares with a cast like this. Peter Lorre steals every scene he is in and chews the scenery left and right. Hazel Court has a small role as the beautiful Lenore, and she turns in a good performance as well. But in the end it is the King of Horror and the Crown Prince of Horror…Karloff and Price…that make this movie a magical experience, particularly in their duel of magic at the climax of the film. Get some popcorn, a nice big drink, and turn the lights out and have fun with The Raven.